UNION Home Minister Sushilkumar Shinde will inaugurate the newly constructed Dr Bahasaheb Ambedkar Cultural Research Centre at Kamptee at 11 am on Sunday. Shinde will also unveil the statue of Dr Babasaheb Ambedkar. Union Agriculture Minister Sharad Pawar will preside over the programme while Chief Minister Prithviraj Chavan will be the chief guest on this occasion. Union Minister of Heavy Industries Praful Patel. Guardian Minister of Nagpur district Shivajirao Moghe. Ramtek MP Mukul Wasnik. Food and Civil Supplies Minister Anil Deshmukh, EGS Minister Dr Nilin Raut. Minister of State for Finance Rajendra Mulak, Planning Commission Member Dr Narendra Jadhav will be the guests. MAHARASHTRA Chief Minister Prithviraj Chavan. Union Ministers Sharad Pawar, Sushil Kumar Shinde and Praful Paiel will be the chief guests for the 57th Dhammachakra Pravartan Din at Deekshabhoomi, at 6 pm on October 13. Former Governor and President of Dr Babasaheb Ambedkar Smarak Samiti R S Gavai will be in the chair. Maharashtra Ministers Shivajirao Moghe. Anil Deshmukh. Dr Nitin Raut. Rajendra Mulak. Former BJP President Nitin Gadkari and City Mayor Anil Deshmukh will be the guests of honour. MPs Vilas Muttemwar. Mukul Wasnik. Dana Meghe, MLA Devendra Fadnavis will also attend the function. 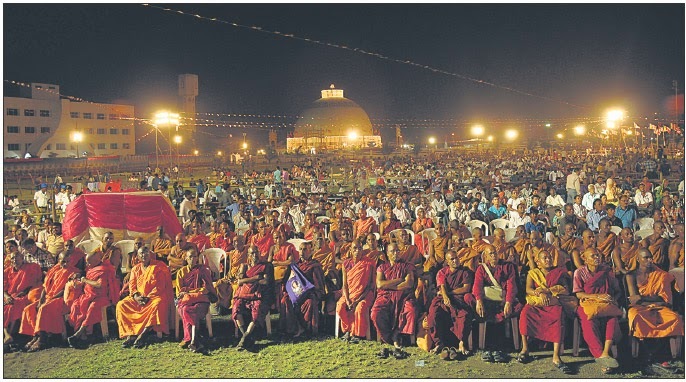 The celebrations started with Bharatiya Bouddha Mahasabha Sammelan on October 10. A large number of devotees from various parts of the country have gathered at Deekshabhoomi. Thounsands of devotees were given Bouddha Dhammadeeksha under the leadership of Bhadant Surei Sasai. The Deeksha programme will continue on Sunday. Buddhist monks from Thailand. Nepal, Myanmar and other places are attending the programme. 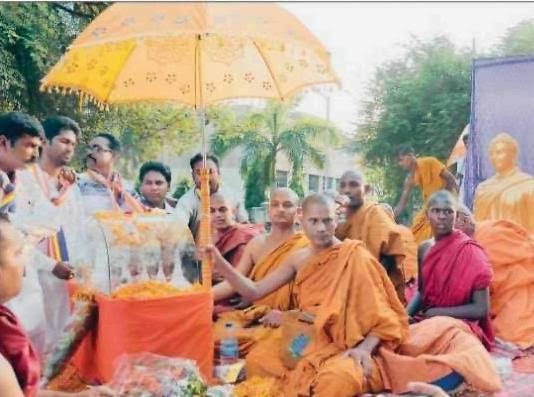 Phule-Ambedkar Vicliar Samvardhan Samiti has organised a Buddha Dhamma Parishad. at Bhadanta Dr Anand Kausalyayan Sabhagruha, Kadbi Chowk on October 14. Bhadanta Sadanand Mahasthavir will chair the meet. Satyashodhak OBC Parishad President Hanumantrao Upre will inaugurate. Triraina Bouddha Mahasangh and NagarjunTraining Institute hasorgan-iscd Dhammachakra Pravarian Din. at Naaglok. Kamptee Road, at 10.30 am on October 13. Dr Ambedkar Students Front of India will undertake signature campaign at Deekshabhoomi and Ajni Railway Station, seeking support to its demand of declaring national holiday on April 14. the birthday of Dr Bahasaheh Ambedkar. Itb is historical post because Deekshabhoomi is a sacred monument of Buddhism located where the architect of the Indian Constitution, B. R. Ambedkar, converted to Buddhism with approximately 600,000 followers on Ashok Vijaya Dashami on 14 October 1956. Telangana Police Recruitment 2018 Notification, Application available at www.tslprb.in, Check TS Police Constable Jobs eligibility, Age limit, selection. RRB ALP Recruitment 2018 - 23801 Assistant Loco Pilots upcoming Vacancy Application form date, RRB ALP Bharti, RRB Recruitment notification, Jobs Details. In India, board examinations refer to the public examinations that occur at the end of the 9th to 10th grade education (SSC), or at the end of the 11th to 12th grade education (HSC) Intermediate Result 2018. The scores achieved in these exams are considered very important for getting into universities, professional courses or training programmes, and even possibly in finding employment. After 13 std board examination are available JAC Intermediate Result 2018. State board examinations are variously referred to as Madhayamik, Secondary State Certificate and Higher Secondary Certificate examinations. They are conducted and managed by education boards of different states in the country AP Intermediate Result 2018. They do not take place simultaneously due to the differences between syllabi and the examination itself UP Intermediate Result 2018. Candidates can check here all details about Railway Group D exam. Inoreader is one of the up and coming news apps. It works a lot like Feedly. You get a news reader that you can customize to your tastes. It includes 28 pre-made topics for those who don't want to dig and find their own sources. The app features offline support, a decent selection of topics, and it'll track what you read. It's not as in-depth as something like Feedly. However, it's a good alternative for those who don't want to do as much work setting their feed up. It's completely free to use.